Difference between revisions of "Amarok"
If you are new to Amarok, you might want to have a look at the Amarok Quick Start Guide. 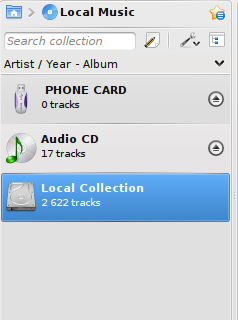 The Media Sources pane on the left is the place where you access your local collection as well as other services: Local Music on top, which is the primary interface to your local collection and connected media such as mp3 players and CDs. There is a section for all Internet Services that you have enabled. Here, you can browse listings of radio stations and podcasts; listen/subscribe to them, interact with your last.fm account, purchase music from online stores such as Magnatune and download independent artists' music from Jamendo and more. The Playlists section allows you to create and manage Dynamic Playlists, access your Saved Playlists as well as the Automatic Playlist Generator. 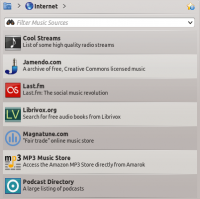 The Files section displays an integrated file browser and the Podcasts section will let you access your podcast subscriptions. This is where all the information is displayed. The central pane contains 3 applets that dynamically change to display context information about the track that is currently playing. You can see the rating, score and play count of the Current Track applet or the last played tracks if nothing is playing, the Lyrics of the song and the Wikipedia page on the artist. 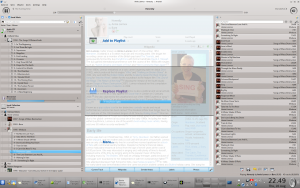 More applets can be added, removed or rearranged using the Applet Bar at the bottom of the pane. 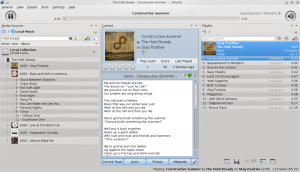 Amarok has the most configurable playlist of any music player in existence. It puts the power in your hands to shape the playlist any way you see fit. To start you off, there are three pre-configured playlist layouts that you can use as starting points to create the layout that fits your flow the best. You can generate playlist dynamically with various bias or use the Automatic Playlist Generator, shuffle, play at random or repeat, queue tracks and save the existing playlists for later use. 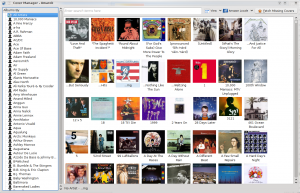 Amarok can support most popular formats for music files. 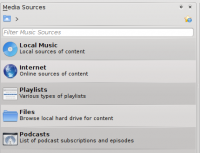 The actual list of formats is dependent on the codecs and audio backend in use on your system. There's also support for traditional playlists — you can create, save and load all the playlists you want. 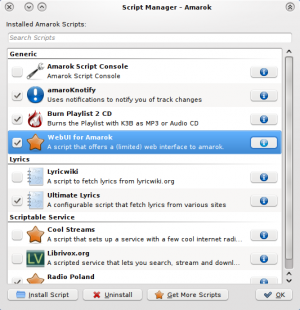 Scripts are add-ons that allow you to extend Amarok’s functionality in innovative ways. Using the Script Manager, you can manage these scripts in that it allows you to install/remove or enable/disable scripts you already have. You can also use the Get More Scripts feature to download new scripts submitted by other users. 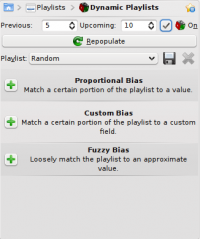 Amarok allows you to create weighted random playlists that adhere to various criteria exactly (Proportional bias) or approximately (Fuzzy bias). For example, you can create a playlist that will be randomly populated by songs that are rated more than 3 stars and are approximately from around the year 1967! where folder is the path to the folder that has the problem. Then select Settings -> Configure Amarok in Amarok main window menu, and open Collection -> Rescan Collection page. Your folder should be visible again now. Warning: this will not work on Windows, as the touch command is specific to Linux and BSD-like systems.